One of the amazing "carrion flowers"! S. gigantea is an exceptionally easy plant to grow on any sunny windowsill. 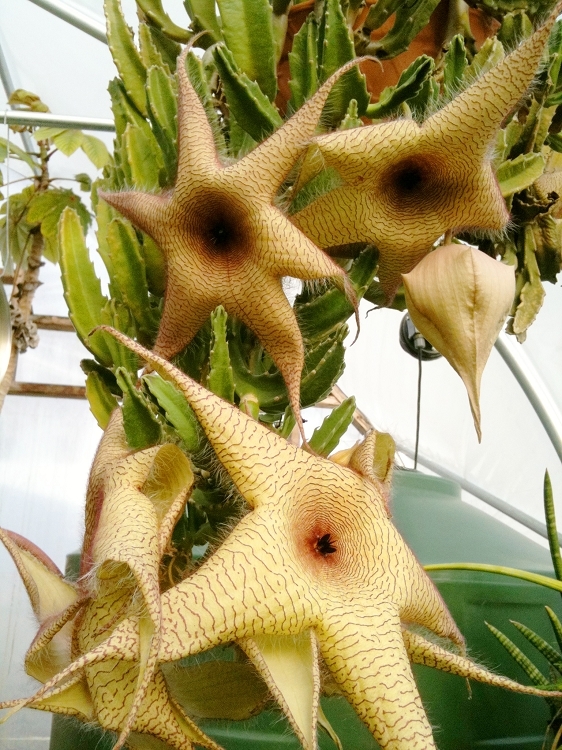 This bizarre plant produces a huge, star-shaped flower nearly a foot across! Pale cream in color it has narrow purple stripes and each petal has a dense covering of purple hairs. The unique aspect of these plants is that they use flies and beetles as pollinators so the "fragrance" is quite unique! Even when not in bloom the fuzzy, succulent upright stems are unusually attractive. A great gift for those gardeners who already have everything else! Available plants are growing in 3" deep pots.